The Penn Manor High School football team defeated Warwick on Friday, October 21 by a score of 34-20. 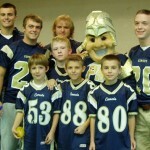 Earlier in the day the team had visited Conestoga Elementary which hosts its version of Football Friday each year. Penn Manor High School football players, cheerleaders and of course, Comet Man visit with the elementary students during lunchtime prior to the football game. 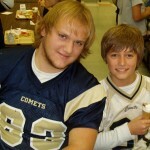 The younger students wear football jerseys in support of the team and have a chance to meet the high school students up close and personal. There is a pep rally energy at this annual event and everyone gets pumped up for the game!